While studying abroad in Seville, Spain, I have been blessed with the opportunity to travel across Europe. This photo was taken when visiting Morocco. Our group was able to stop along the beach and take camel rides. While waiting for my turn, I had to get a selfie with a camel. 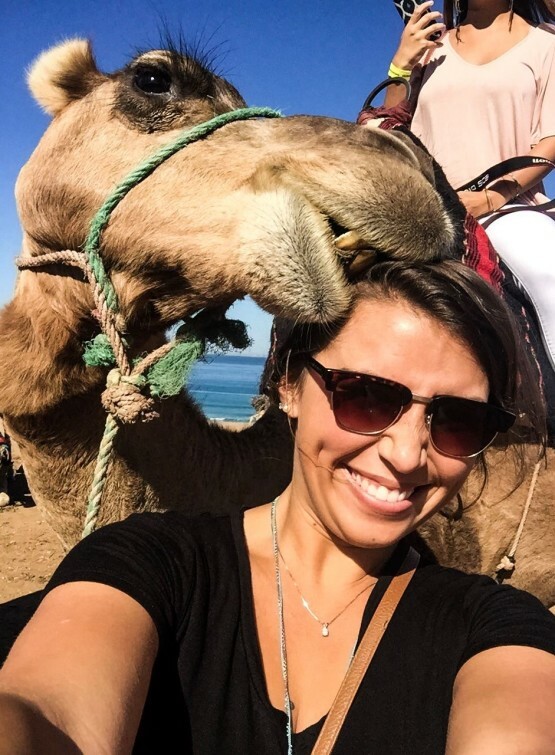 When getting ready to take the picture, the camel decided he wanted a quick snack and found the closest snack to him was my head. By visiting Morocco, I was able to see a way of life that is not usually seen by people from the States. The culture was very conservative when in comparison to the way of life in the States, or even in Spain. We had to make a point to not show too much skin, which meant pants and long sleeves, even though it was about 80° outside. Though the culture was a complete shock from what I was used to, the people were some of the friendliest people I have met and was very grateful for the experience.